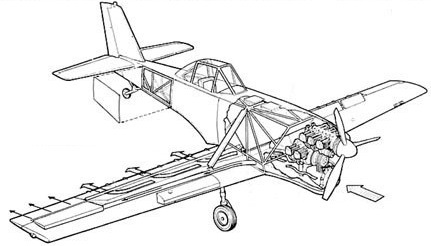 The 1965 Distributor Wing DW-1 was a single place agricultural aircraft with two stacked Lycomings; a 350hp IGO-540 for flight and a 108hp O-235 driving an axial-flow faninternally-mounted spray system. First flown on 30 January 1965, the plane climbed at 350fpm at gross weight of 5,200 lb with just the O-540; the O-235 powered the spray system and provided thrust augmentation. The Guide vanes in the wings increased flap effectiveness. Air flows into a hydraulically-run metering gate feeding material from the hopper, through wing ducts and out variable wing slots. 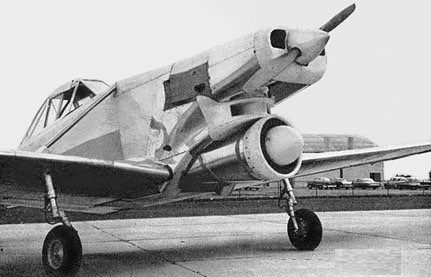 The hopper was a drop-in unit, and fuel was in leading-edge tanks.